Alistair Maasch dislocated his shoulder in the warm-up ahead of what would've been his Hastings Priory debut last weekend. Hastings Priory may have played very little cricket last weekend, but still managed to lose two opening bowlers to injury. 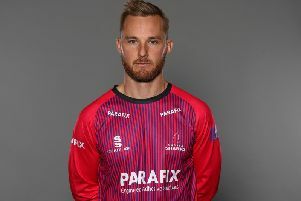 Overseas player Alistair Maasch dislocated his shoulder throwing a ball in the warm-up ahead of his planned debut against Middleton and is likely to be out for around four weeks. On top of that, Adam Barton broke his thumb playing for the MCC Young Cricketers the previous day and could face a similar spell on the sidelines. After last weekend’s abandonment against Middleton, Priory will be back at Horntye Park today (Saturday) for the visit of Brighton & Hove and are likely to field a similar side. Priory and Brighton are two of five teams level on 40 points at the top of the embryonic league table having won their opening matches and then had their second games rained-off. Brighton would’ve felt particularly frustrated by the weather last weekend as they had opponents Ifield 64-5 when play was abandoned. Today’s match will get underway from 12noon at Horntye Park.